I’ve filled in at Big Box opticals where the staff tells me that the usual doctor doesn’t charge for follow ups on things like red eyes. Unbelievable. Not only are these doctors leaving money on the table, they’re making the rest of the profession look bad. 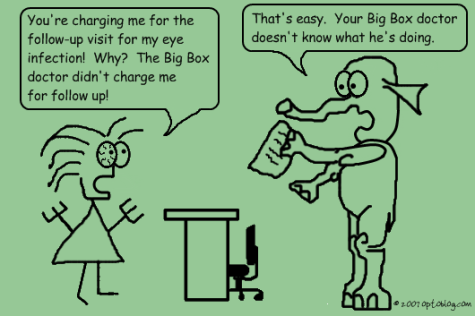 How come patients question optometrist fees so much? When they go to their PCP for a check-up on their HTN, do they expect to walk out without paying? Do they expect their PCP to refill their HTN meds indefinitely without a follow up exam? Eyecare is healthcare, and I resent the insurance companies for making the illusion that it’s something separate (vision insurance vs. medical insurance).